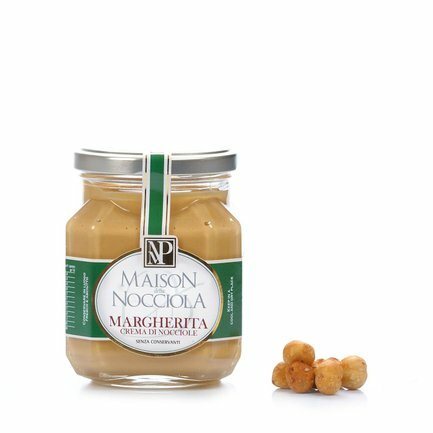 Maison della Nocciola Piemonte's passion for the Piedmont IGP Hazelnut has led to the creation of Margheritacream. A Piedmont hazelnut cream containing cocoa, Margherita is a delicious spread with an intensive hazelnut fragrance. Thanks to the nutritional properties of the hazelnut (the main ingredient of this cream - 52%) is packed with vitamins E and D and calcium, which is essential for healthy skin and bones. What's more, it's also completely free of cholesterol. Superb on bread for breakfast or a mid-morning snack, try mixing it with warm milk or adding it to plain yogurt bring a special flavour to the table. Ingredients PIEDMONT HAZELNUTS IGP (52%), cane sugar, SKIMMED MILK POWDER, cocoa butter, emulsifier: SOYA LECITHIN, vanilla. For more information on product labels, please contact our Customer Service department. The information on the labels of the products may vary for reasons beyond our control, therefore, there may be discrepancies between the information on the site and that on the products delivered. Please always check the information on the product before consumption or use. Piedmont confectionery tradition owes a great deal to the hazelnut and hazelnut processing techniques. A prized variety with exceptional organoleptic and nutritional properties, the Tonda Gentile delle Langhe hazelnut is the first product to obtain IGP protected geographical indication certification in Piedmont. 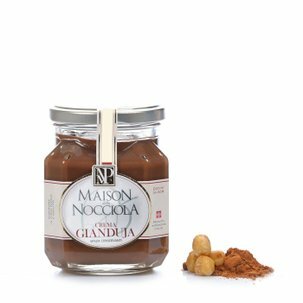 The history of Maison della Nocciola Piemonte is deeply intertwined with the Tonda Gentile hazelnut because it's founded on the greatest reverence for antique flavours, unearthing historic recipes and preparing them with the aid of modern technology.